An antioxidant formula designed to support skin affected by sun-damage, fine lines and wrinkles. Creme Complete may also reduce symptoms in conditions like lichens sclerosus. This is the same formula as the traditional Creme Complete with a different range of natural essential oils used for fragrance. The essential oils used are rose essential oil with a hint of rose geranium. 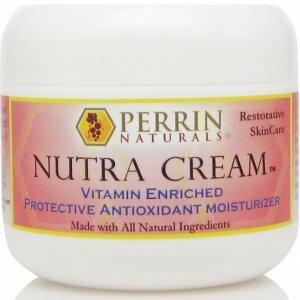 It is an amazing totally natural way to support sun-damaged skin, it may also assist with rosacea, age spots, lichens sclerosis and many other abnormalities of the skin. 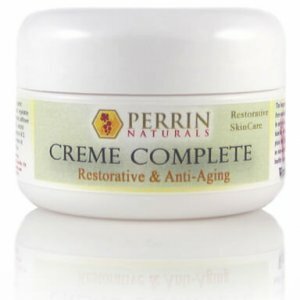 The Creme Complete is the strongest cream that Perrin Naturals produces and it has an incredibly high level of active ingredients. This enables it to restore, moisturise and protect. 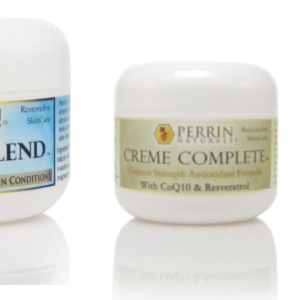 If your skin condition is severe you may need to consider combining Creme Complete (during the day) with Perrins Blend ointment (at night). The Power of Nature – how does it work? Resveratrol and grape seed extract are powerful antioxidants that have been shown in studies to arrest the growth of abnormal skin cells and encourage these abnormal cells to self destruct. Alpha lipoic acid has been shown in studies to reduce fine lines and wrinkles. 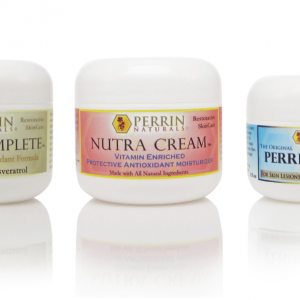 CoQ10 gets your skin breathing and fully functioning thus slowing the aging process. An array of antioxidants to fight damage caused by our modern life: CoQ10, alpha lipoic acid, N-acetyl cysteine, vitamin C and E, grape seed extract, resveratrol. Sign up to our newsletter to receive discounts.